Ada was established in 1889 as a single general store at the half-way point along the postal route between Stonewall and Center. The new town quickly became a railroad and shipping hub for the agricultural products of the surrounding area. By 1903, Polish Jew Sam Harris and his wife Lena had opened the Harris Hotel, which anchored downtown with a café, a sweet shop, and a cigar store in the lobby. Max Levin, writing in 1908, noted three Jewish families in Ada, for a total of 11 people, all from the Russian Empire. Nearby Seminole was the site of oil boom in 1926, which brought more people to the area. Ada and Seminole have been home to a small community of Jews since the early 20th century. Jews became an important part of the local merchant class in Ada. Sam Sachs came to the U.S. in 1906 from Lithuania and lived in New York and Shawnee, Oklahoma, before moving to Ada in the 1910s, where he founded the Ada Iron and Metal Company. His wife Sarah and son Sidney later got stuck in Lithuania, where they’d been visiting Sarah's family when World War I broke out. After the war, Sarah and Sidney were allowed to return to Oklahoma. Aside from a two-year move to Detroit to further Sidney’s Jewish education, Sam and Sarah spent the rest of their lives in Ada. Sarah kept kosher and refused to drive on Shabbat to the end of her days, though local residents often slowed their cars to offer her a ride. While he didn’t share his mother’s Orthodoxy, Sidney Sachs went on to become president of the local B’nai B’rith chapter, as well as president of the Lion’s Club. William Gluckman, who opened Gluckman’s grocery in Keota in 1913 and moved it to Ada to 1927, was employing 14 people by the 1930s; he headed the local Chamber of Commerce in 1958. Brothers Max and Martin Soref, who emigrated from Russia to Oklahoma in the mid-1920s, owned the Leader Shoe Store and Martin’s Style Shop, a women’s clothing store. The brothers never married and spent over 30 years living together in the Aldridge Hotel in Ada. 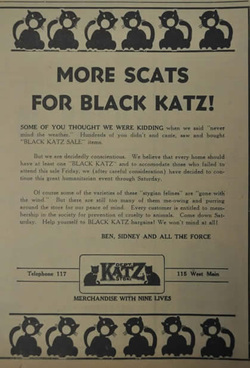 Ben and Sidney Katz opened Katz’s Department Store in 1926. The brothers were part of a tradition of Jewish commerce in the agricultural town that stretched back at least to the beginning of the century. Their store was only the newest in a family chain that had begun in 1896 when Jake Katz opened a department store in Stillwater. Jake’s cousin, Lester Katz, opened a Katz’s store in Sapulpa in 1910 with his father Abraham. Ben, the seventh Katz child, had been 18 when his family moved to Sapulpa, where he worked in the shoe department until World War I, when he was drafted. After finishing his military service, Ben went to Kansas City, where he met and married Sadie Bardine, a recent Russian immigrant. Sadie came from an Orthodox family and found it very daunting to adapt to her husband’s classical Reform Judaism and the difficulty of finding kosher meat in Sapulpa. She lived with Ben in Sapulpa from 1924 until 1926, when Ben decided that a life as a shoe clerk was not enough. By the end of that year, he and Sidney had opened their own department store in the wild town of Ada, famous for a 1909 lynching in which a mob broke four men from jail and hanged them for murdering a local U.S. Marshal. By 1937, 40 Jews lived in Ada, 22 in Shawnee, and 37 in Seminole. Most of these families were in the retail or scrap metal business. In Shawnee, Joseph Cohen owned the People’s Store, while Harold Cohen had Cohen’s Department Store. Si Beckenstein owned Rosenfield’s Jewelers in Shawnee. Morris Brown owned a scrap metal business in Seminole, while Charles Segall owned Shawnee Iron & Metal. 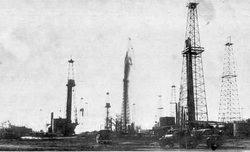 The discovery of oil transformed the area around Seminole. Meyer Moran came to Nowata, Oklahoma, in 1921 at age 16. A few years later, the Russian Jewish immigrant moved to Maud, where he lived with his family while setting up Moran Pipe and Supply. This oil field supply business thrived after the discovery of oil in Seminole in 1926, which transformed a sleepy village of 800 people into a booming town of 30,000 within a year. Before housing could be built to accommodate the continuous flow of wealth-seekers, many people wandered the streets, homeless, and slept under pool tables or in movie theaters. For a period after the discovery, Seminole was producing one third of the world’s oil. Moran moved to Seminole in the 1930s, and his son Melvin joined him in the business after graduating from the University of Missouri and serving a tour of duty in the air force. The company soon moved into oil exploration and drilling, becoming extremely successful. Meyer Moran’s brother-in-law, George Kahn, later joined the business, running the scrap oil field supply operation for many years. While stationed in London, Melvin had a blind date with Jasmine Lindsay, an actress who had been cast in the original West End production of South Pacific. Melvin asked her to marry him and come home with him to Seminole, which she did. Although Jasmine was initially sad about leaving London for the relatively unsophisticated life of Seminole, the Morans would go on to have a tremendous impact on their town. The first organized Jewish religious activity in the area was in nearby Shawnee, where a small religious school was created around 1904 with about eight children. The school met in a converted house that was also used for regular services in the early years. Over time, the activity of the Shawnee congregation faded. Yet as late as the 1930s, the Jews of Shawnee would meet for High Holiday services in the Whittaker Building. By 1940, the eight Jewish families of Shawnee were attending High Holiday services in Oklahoma City. ​During the heyday of the oil boom in the 1920s and 1930s, traveling rabbis would occasionally come through the area while the Jews scattered in the towns of Pottawattamie and Seminole Counties would occasionally meet for services. In 1934, the newspaper in Ada noted that most local Jews would be traveling to Oklahoma City to observe the High Holidays. Joseph Levenson, a rabbinic student at Hebrew Union College in Cincinnati, led High Holiday services in Ada one year in the late 1930s; the services were held at a local Baptist Church. They also met for community seders during this period. Since there wasn’t an organized congregation or religious school at the time, Jewish families would send their sons to the big city for bar mitzvah tutoring. Meyer Moran sent his son Melvin to live in Tulsa for a year to prepare for his bar mitzvah. B'nai B'rith conference-goers in Ada, 1940. Jewish religious life in the Seminole-Ada area gained a new momentum when a Mrs. Farab, who came to Oklahoma in 1938 after fleeing Poland with her husband, settled in nearby Konawa. Displeased with the lack of formal Jewish life in her new home, Farab organized a Sunday school for the Jewish children of the surrounding towns, and was received warmly by the community. She taught the children with the help of other Jewish women in the area. After her husband killed himself during the war, Farab moved to New York. Despite this loss, Jewish religious life continued to grow. In 1937, Jews in the area created a B’nai B’rith chapter. Its members came from all over the region. Its president, Abe Pinsker, was from Shawnee, while vice president I. Oppenheim came from Wewoka; charter member Richard Levy was from Seminole. That same year, women in Ada and nearby towns established a chapter of the National Council of Jewish Women. Lena Harris was the first president of the chapter, which had 35 members in 1937. The NCJW was closely linked with the B’nai B’rith Lodge; both groups would meet at the same time at the Aldridge Hotel in Ada. Original home of the Seminole Hebrew Center. Photo courtesy of Stu Phillips. In 1946, Jews in the area finally established a formal congregation and purchased a house on University Street in Seminole. After converting the home into a makeshift synagogue, they named it the Hebrew Center. At the urging of the Conservative and Orthodox members, services were held in Hebrew. While there was no rabbi, many of the members were knowledgeable enough to lead services. Members also revived the Sunday school, which had 24 students in 1963. In addition to meeting its congregants’ religious needs, the Hebrew Center lived up to its name, bringing together Jews from Ada, Seminole, Shawnee, Wewoka, Konawa, Norman, and even Prague for a poker game that followed the brief services each week. A percentage of the poker pot was always set aside for the building fund, and in the 1950s the congregation used that money to purchase a lot down the street. 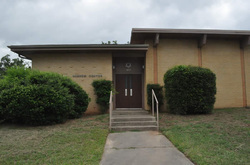 In 1963, the congregation dedicated a new Hebrew Center, which continues to serve them today. Current home of the Seminole Hebrew Center, built in 1963. Henry Katz has been treasurer of the Hebrew Center in Seminole, Oklahoma for over 30 years, and as he likes to say, in all that time he’s never been asked for a financial report. There have never been many books to keep, but that’s beside the point: the Jewish community of Seminole and the surrounding towns is small enough that trust is often enough. While Jewish merchants were once common in Ada and other small towns of the area, their numbers declined at the end of the 20th century. Gluckman’s Department Store in Ada closed by 1969. Henry and Alfred Katz continued to operate their department store in downtown Ada until 1989, when slow business forced them to close. It was the last Katz’s store still in operation, and the last Jewish-owned business in downtown Ada. In 1985, the Katz brothers had opened a ladies’ wear shop in the mall nearby, but that store closed when Henry retired in 2004. The few Jews left in Seminole and Pottawattamie Counties have been very involved in their local communities. Bob Rubin has worked with Jewish inmates across Oklahoma, teaching a class on Jewish ethics in a nearby prison. He has served on the Oklahoma Corrections Advisory Council. In the early 1960s, Melvin Moran ran for city council, and he was so popular in his first term that he served six more. For each of the six later elections he faced no opposition. When he had finished his duties as councilman, he was encouraged to run for mayor of Seminole, a position he served in from 1975-79. Moran also served on the boards of the local community college and the board of the First National Bank. He and his wife Jasmine started a community Christmas dinner than feeds 700 needy people each year. 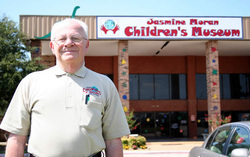 The Morans’ most notable contribution to Seminole is the Jasmine Moran Children’s Museum. During a 1993 trip to Flint, Michigan, to see their grandchildren, Jasmine and Melvin visited the children’s museum there, and were inspired by it. They thought Seminole needed one, and they wanted it to be the best. After crossing the country and visiting about 50 different children’s museums to get ideas, in 1993 they opened the Jasmine Moran Children’s Museum, which draws tens of thousands of visitors to Seminole each year. Multimedia: Henry Katz of Ada talks about the founding of the Seminole Hebrew Center and how members of the Jewish community raised money to build a new facility in 1963. While the Jewish communities of Ada and Seminole have never been large, they have remained dedicated to maintaining Jewish life in the area and have made significant contributions far beyond their small numbers.